What is the difference between a ‘power’ and a ‘principality’? What is the difference between oppression and possession? The problem with these 2 words is that they separate all demonic presence/activity in a life into two distinct camps, whereas in reality there is a continuous spectrum of demonic influence, from minimal to maximum. One or both of these 2 words appear in various English translations, but the Greek original just uses daimonizo, tr. demonized, in all cases. This word allows for a whole spectrum of demonic presence/activity, from “the demon-possessed man” (Lk 8/36) to “all who were under the power of the devil” (Ac 10/38; ESV ‘oppressed by’). The word daimonizo and the ‘scale’ of Biblical examples confirm what common sense and our ministry experience suggests: that there is a whole range of demonization, from influence/affliction to control/possession, and that it is not necessary to ‘pigeon-hole’ a sufferer before one can minister (although understanding the degree of seriousness will help). P.S. Most Christians believe that believers cannot be possessed by a demon (because they are owned by God) but they can be (although they do not need to be, and should not be) oppressed by one (e.g. if sin has opened a door to it). Just as there can be God-weather and devil-weather but most weather is just weather-weather, so there can be God-sickness (e.g. Job 33/13-28: God uses illness to bring someone to repentance – and then heals him) and devil- sickness but most sickness is just sickness-sickness! That is, we live in a fallen world, and one of the realities of that fallen world is the presence of a multitude of bacteria/viruses and sicknesses (Ro 5/12, 8/20-21). Just as all sickness is not the result of sin (Jn 9/1-3), so all sickness is not the result of demons. We must guard against looking for demons behind every sickness. Nevertheless, some sickness is the result of demonic activity (e.g. Lk 11/14); here we have to cast out the demon in order for the person to be healed (as part of our healing ministry). How do you know if someone’s behaviour is demonic or psychological? Sometimes a person’s extreme behaviour is caused by severe psychological/psychiatric factors, sometimes it’s demonic (a possibility dismissed by much psychology/psychiatry), and sometimes it’s a combination. It is often very difficult to discern which – and those who minister in this area regularly admit to not having a clue! Some reading on psychological/psychiatric conditions/symptoms, getting input from those who have a track record ministering in these areas, and gaining your own experience over time, can all be helps to discerning the root – but even so one can still be wholly reliant on the revelation the Spirit gives you in a situation. Obviously, the cure must fit the cause – respectively: psychological/medical treatment, deliverance/ministry, or a combination of both. Can demons cause physical harm (e.g. scratches on your back)? In extreme cases demons can cause physical harm; in other cases demon ‘possession’ can be so severe that it causes the person possessed to behave in such a way that they harm themself (Mw 17/15 || Mk 9/18 || Lk 9/39, 8/27&29cf.v35). Obviously, there is no way a Christian can be harmed by a demon or themselves in this fashion. P.S. As a quite different matter, we should note that Christians can be harmed by the persecution of men (inflamed by Satan: Ac 9/13) or that their own backsliding can lead them to the ‘pig sty’ (where they can be robbed by Satan: Lk 15/14-16); also, that God may use the attack of Satan to bring about even greater godliness in and blessing on his servants (Job ch1&2 cf. ch42), and that church discipline hands a sinning believer over to Satan to be refined and restored (1 Co 5 cf. 2 Co 2). 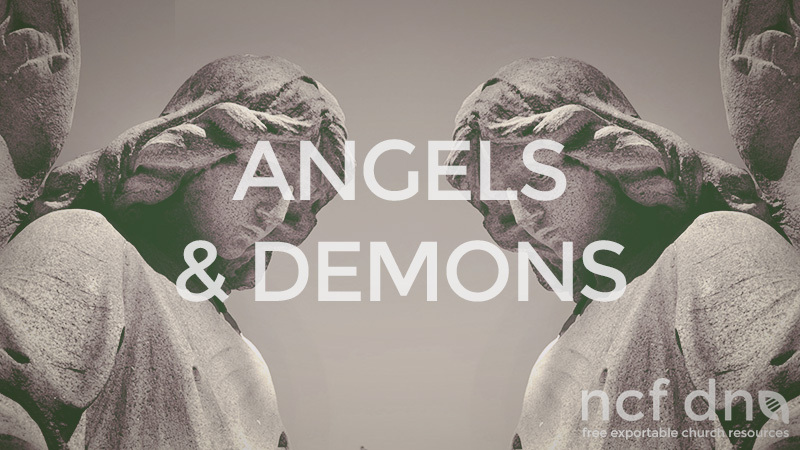 Are ghosts, haunted houses, etc demonic – and, if so, why would demons live in your house? If we are talking about ‘the spirits of the departed’, the Bible does not believe in ghosts or haunted houses – period! “A great chasm has been fixed” between the living and the dead so that no-one can cross over from one to the other (Lk 16/26). In many (if not most) cases such phenomena are not real: they are merely the imaginings of frightened or deceived minds that are conditioned to expect and believe what they ‘see’ or ‘hear’. If such phenomena are real then they are demonic manifestations designed to deceive and intimidate – to rob, kill and destroy human lives. Is it ancestors speaking to ancestor worshippers or demons? Given what has just been established from Lk 16/26 [see Q11], it is not ancestors (any more than it is dead people speaking at a séance): the departed may not and cannot. If it is not some trickery from the person conducting the ceremony (not unknown), then it is a demon. Remember, demons are supernatural/spiritual beings that have been around since creation: they would know all about the person being summonsed and would be able to impersonate them – and so very easily convince the vulnerable, gullible person who is eager for it to be their ancestor/relative. Where do I draw the line between not getting involved in my parents’ ancestor worship and honouring my parents because that’s what the Bible calls me to do? You draw the line exactly there: you honour your parents without getting involved in their ancestor worship. There will be many things that they are and which they do, as well as simply the fact that they are your life-source, which you can and should honour; there will be other things about them (including their possible ancestor worship) which you can’t and don’t. Anything that does not compromise your primary commitment and allegiance to Christ (and that includes all truth of doctrine and holiness of life contained in his Word) you can honour or participate in; everything that does you cannot. For example, unless it would make a brother with weaker faith stumble, Paul condoned our eating meat sacrificed to idols because we know idols are but figments of man’s imagination and in fact the meat comes from God (1 Co 8; 10/25-30); but he did not condone taking part in idol feasts – for joining in such an act of ‘worship’ conveyed belief in that idol and broke the First Commandment (10/14-22). Similarly, your faith may free you to eat meat sacrificed at an ancestral ceremony, but you could not take part in the ceremony.